When you stay “on property” at a Disney resort, one of the coolest perks is the availability of Extra Magic Hours. Read this short guide to get the most out of this wonderful feature! 6. 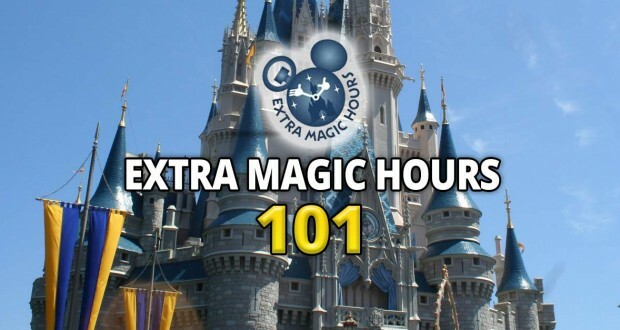 What are Extra Magic Hours? Extra Magic Hours (EMH’s) are special early opening or late closing hours provided to Disney resort guests. The amount of time given varies. Typically, you’ll find that morning EMH’s are an hour. So, if the park opens at 9:00am to the public, you’ll be able to enter at 8:00am. Sometimes evening EMH’s are longer- the Magic Kingdom, for instance, may close at midnight on a busy summer night but stay open until as late as 3:00am for EMH’s! 5.How often are they offered? There should be at least one every day of your trip at a selected park. During busier seasons, there are more EMH opportunities offered. The hours are set in advance, but are subject to change right up until the week they are offered, so check back frequently, especially if you are travelling during a peak time! 4.How can I take full advantage of EMH’s? Any strategy for using them? You’ll want to know which park offers EMH’s in advance. This information is available on Disney’s website. At times, you may find that additional hours are added as your trip nears, or that the hours themselves are extended. For example, if travelling during Spring Break, you may find that the 8am EMH at Magic Kingdom has been changed to 7am a few weeks prior to your trip. This is critical information, and you should definitely check for updated hours as close to your trip as possible. 3. You will want to arrive at the park before the EMH time. If you miss the EMH time, you might be better off going to a different park. EMH’s actually can have the effect of increasing park crowd levels for the day, making the park even busier. It is still worth going to the park with the EMH as long as you actually get there to take advantage of the EMH time. Many families plan their park days based on the EMH schedule, but often don’t get up early enough to actually take advantage, resulting in an influx of people later in the morning. You might like spending the early morning hours at one park, and then hopping to another after the EMH time is over. Parks with evening EMH’s may also fill up later in the day in anticipation of the late night hours – if you are there, just make sure you stay until the very end to take advantage of the lower crowds when the daytime crowds thin out. 2. How does Disney know if I’m a resort guest and entitled to EMH’s? There’s actually nothing stopping non-resort guests from staying in the parks for the evening EMH’s; however, they will be unable to ride any attractions because their room key or Magic Band will have to be shown at ride entries. 1. A final tip: know what attractions are actually open during the EMH’s you are attending! If you plan to head straight to Splash Mountain during your morning EMH at the Magic Kingdom, think again. Certain areas and attractions are accessible during EMH’s, while others are not. At the Magic Kingdom, only New Fantasyland and Tomorrowland are open during the morning EMH’s. Riding your favorite attractions in those areas, and then heading to Adventureland or Frontierland when the park opens an hour or two later to the other guests is a solid strategy. During evening EMH’s, some attractions may not be open. You can find full lists of what’s open during EMH’s on Disney’s website. Extra Magic Hours are one of my favorite perks of staying on Disney property. If you’re staying at a Disney resort, be sure to take advantage of them! Start planning your next Disney trip with an Authorized Disney Vacation Planner. They’ll help you get the best price for your vacation, share expert advice and their services are totally FREE! Meredith Smisek is a kid at heart and works as an elementary school guidance counselor. She lives in New Jersey with her husband, dog, and parrot. Meredith's hobbies include cooking, playing ukulele, and "talking Disney" with anyone she knows who is planning a trip to Disney or has just returned.